Drawn in black conte–it is very difficult to keep track of where one is with one’s drawing in relation to the leaves and spaces! Drawn in felt tip, oil pastel, and wax crayon. Need fatter felt tips so colour can be applied in blocks. The felt tips are ruined by applying over the oil pastel. and are too dry to give a consistent block of colour. However the flowers are vibrant and lively despite the more sketchy container and background. This was drawn on very absorbent paper in felt tip fine and thicker and wax crayon and ink.The fine felt tip smudged reasonably well but the thicker felt tip pens were much too dry to smudge. The ink (purple/pink) also dried very quickly. 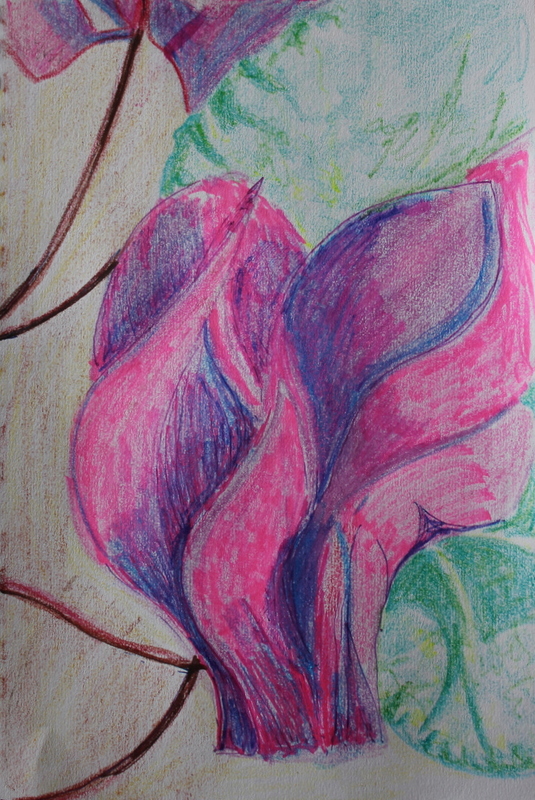 I avoided oil pastel as it is quite bright and aggressive in colour, the wax crayons are much softer particularly on this paper. 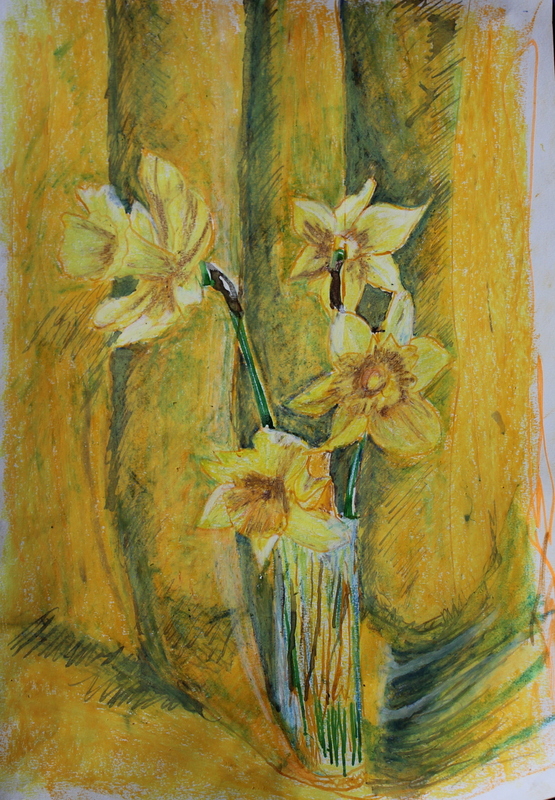 This started as a drawing in coloured pen ,the outline of the daffodils and curtains was done in yellow ink. I wanted to investigate yellow against yellow and I intended to avoid oil pastel -however as the colours with wax crayon and brown ink built up the yellows, oranges, orchres and browns became too stark and I used oil pastel to bring the colours back to more pleasant hues, overlaying with lemon and white. I resorted to felt tip to produce brighter colours—once again it did not work well over oil pastel, and being too dry , I dipped the tips in water-but this felt more like a venture into painting rather than drawing. The hatched shading done in brown ink was much too stark and coarse and was toned with blue felt tip and then oil pastels in yellow and white-this made the background colours too strong and so I scratched back into them with a palette knife. The clash of colours particularly with the oil pastels was made more harmonious by the use of lemon yellow overlay in the background. how do I think/feel about this? I learnt a lot about blending colours using and the interaction between different media and the use of scratching to produce texture or remove media. Also the use of overlying colour to bring harmony to the image by joining areas through colour. how well (or badly) did it go? As the image was built up as I went along , the overall effect is one of overwork and somewhat messy. what did I learn? To think about what I am trying to achieve and practice other images before I set out on the final image (having said that this was one of the practice images as directed by the OCA handbook). what will I do differently next time? 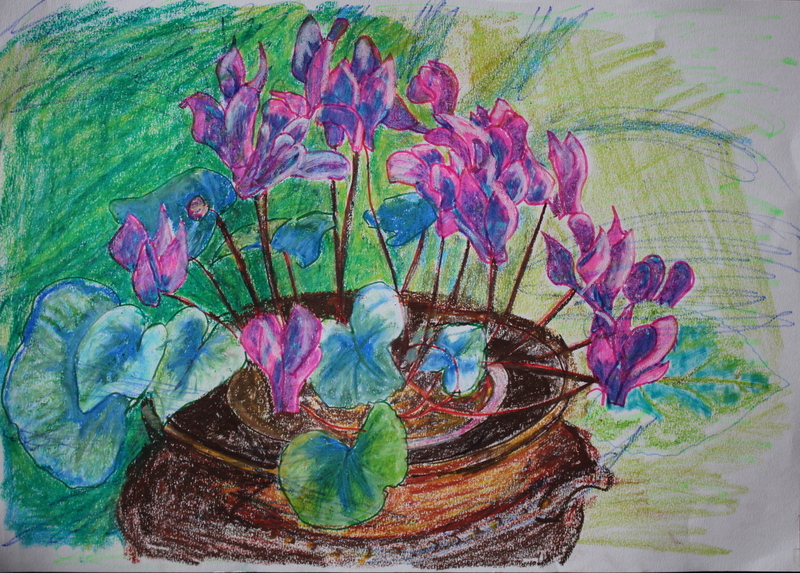 Do preparatory sketches and learn how the media and colours work together. what have I achieved? A colourful image in relative monochrome with a feeling of lost frailty in the structure of the daffodils. how have I put any theory into practice? Theory??? how does what I have been doing lead to me becoming better at a skill? Learni9gn about how media and colours interact and the need to think before I leap and practice before I venture into a final image. The daffodils look at little straggly and pathetic against the yellow curtain, this is added to by the scraggly hatching in the shade. Negative space allows one to study the relationships between ojects and helps place one in relation to another –It also gives the drawing an abstraction which like Nicholson’s paintings leads to observation of the whole rather than the apparent subject of the picture. 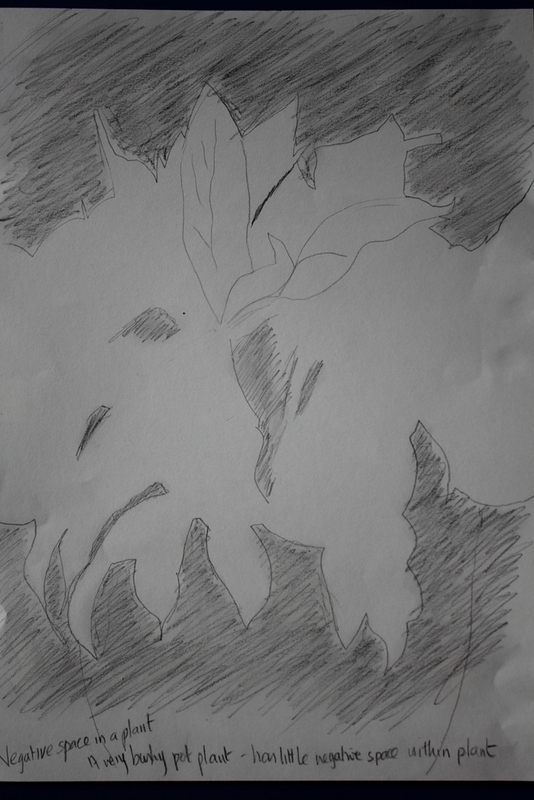 What techniques did you use to ensure you drew your plants in proportion? Looking at the relative sizes of the petals or leaves -where one crossed another and the size and shapes not only of the petals and leaves but also of the spaces between them. 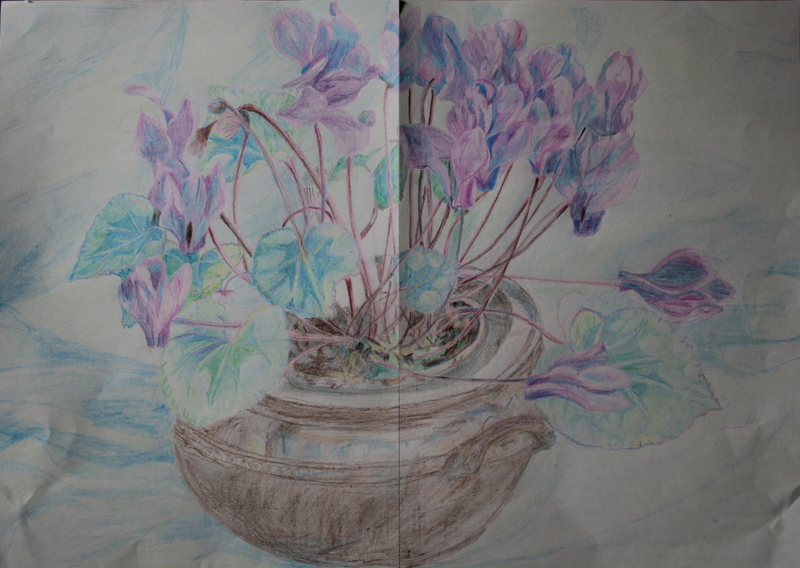 I also measure sizes with the pencil -particularly when attempting to draw circular vessels in which the plants stand. 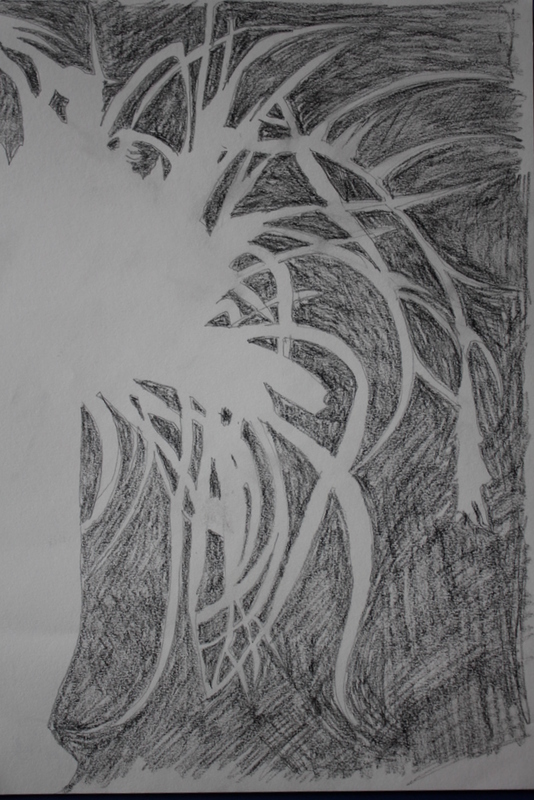 How did you achieve an effect of three dimensional space in your drawing? The colours and the use of darker tones to represent light and shade and the positioning of leaves and petals as they overlap and relate to the background.